Brick and mortar stores choose Clover POS for its accessibility, flexibility, and usability. The Clover POS ecosystem leverages modular additives that allow business owners to tailor their POS solution to their preexisting, business model. Through these applications, businesses produce powerful business intelligence and defy traditional check-out standards. Using a productivity-centric UI/UX, Clover transcends the usual pain points (processing time, connectivity, and scalability), becoming a positive facet of brand experience and encouraging repeat business. Retailers can use Clover POS to reduce check-out time, minimize the time allotted to employment training, and decrease downtime caused by input errors. A survey on small businesses from 2014 found "thirty-nine percent of retailers say improving efficiency is the main reason for evaluating new retail systems, either because their system is outdated or unreliable, or they are looking for more robust features". Small businesses are realizing that the right POS (Point-of-Sale) system makes a considerable difference in customer experience, trickling through the entire sales funnel, all the way down to profitability. The feast or famine business cycle that many retailers encounter is tricky to manage, debilitating revenue and making it impossible for retailers to settle comfortably somewhere in the middle. The shorthand answer is: look for a new POS system and never look back. In selecting a POS that moves fluidly with your natural ebb and flow, you turn seasonality into opportunity. Businesses are demanding Clover integrations because of its many unique features. However, software development companies can customize and configure any POS to have any features desired. So what separates Clover from other POS systems? In this blog I will provide a big picture look at the Clover's POS, zeroing in on the attributes that establish Clover amongst competing POS systems. Small businesses understand the value of loyalty-happy customers and employees facilitate repeat and referral business, and that repeat and referral business has the power to inflate or deflate every brick and mortars' bottom line. So, how do we build loyalty? Traditionally, we put the onus on sales associates or in-store experiences unrelated to check-out. As retailers, we have become obsessed with brand interactions, things like product availability and product placement. What we have forgotten is the power of a painless transaction. The importance of payment technology in an integrated retail flow should go without explanation; POS represents the very end of the funnel, the final impression customers will leave with. This impression should be as speedy, convenient, and as simple as the rest of the buying experience, existing as a functional part of the each retailer's customer retention strategy. The good news: we are finally building bridges between our gaps in usability. The demand for sophisticated POS technology is on the rise, and Clover offers an unparalleled maturity in this market, boasting a transparent and continuous timeline of usability evolution. Retailers can use Clover POS to reduce check-out time, minimize time allotted to new employee training, and decrease the downtime caused by input errors. Clover forges a productivity-centric environment through UX/UI breakthroughs that opposing POS systems just have not reached yet. Clover's usability builds better businesses through more efficient engagement. There are many POS products that advertise the same usability, but it in practice, things do not quite play out that way. Small businesses thrive off of the traffic of seasonal buyers; holidays are a refueling period, a time for retailers to pack away nutrients for the winter and brace for a latency to come. An unreliable POS system threatens that sustainability, draining the power source many small businesses leverage as a safety net. Buggy legacy systems can dip out at the most critical moments, paralyzing profitability. The speed and reliability of Clover is undeniable; two quality we can attribute to a growing app market, 8-core, state-of-the-art Qualcomm® Snapdragon™ processor, and 4GB memory. Clover systems maintain optimal functionality in both online and offline mode, online meaning Ethernet or Wi-Fi connectivity. The processing software also has an offline mode where it can still run even if the internet is down, ensuring that businesses continue to serve customers and complete transactions. The functional components, including the pivoting touchscreen display, create a better checkout experience for both employees and customers. Mobility has become synonymous with accessibility, and it is no secret that accessibility drives sales. 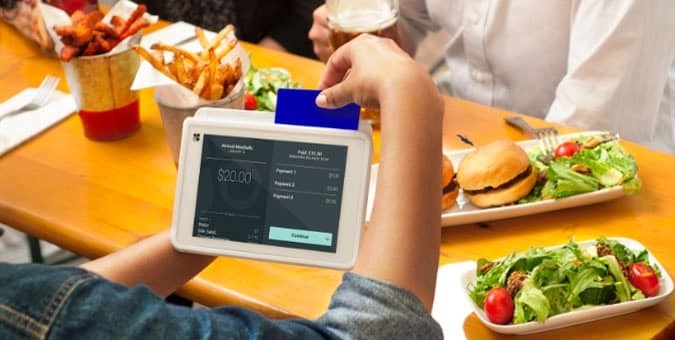 Mobile POS systems support the immediate gratification we are all accustomed to, facilitating dynamic transactions and dismantling the tether tying check-out to a singular point. Clover is ahead of many competitors in this regard. Clover's mobile POS lets retailers track their sales, profits, and inventory levels at different store locations using a unified dashboard on their mobile device. Some options integrate with loyalty management programs so customers can access them from their mobile device. It also improves sales and data security. Clover's mobile opportunities allow sales associates to conduct transactions easily from any location inside the store, thus widening the opportunity for purchase. In terms of the more technical details, transactions carried out through a mobile POS are fully encrypted and do not store card data. The Clover mobile devices accept all swipe debit and credit cards, EMV chip cards and NFC-equipped smartphones. Clover products help business owners to gain back control over data trend and sales trends, providing the toolbox they need to transition this information in viable, business intelligence. Our research shows that businesses are clearly recognizing the importance of the feature. In a recent survey among single-store POS buyers, 48 percent requested for sales reporting and analytics capabilities in a POS system, capabilities native to the Clover platform. Clover POS can be integrated to Shopify, Magento, ERP and other eCommerce providers and create reports in real time, and is available through the Clover App Market. The Clover system is fully-loaded with over 20 pre-installed apps. For businesses looking for a more personalized atmosphere, there are hundreds of other applications to choose from, including those reporting/analytics modules we discussed in the paragraph above. In selecting a formula cohesive to a preexisting, commerce model, business owners receive a Clover POS system tailored to their individual needs and objectives. The heightened functionality optimizes workflows by molding to native sales funnels. Clover POS supports employees in their quest for closes, forging a more positive brand experience for both employees and customers alike. Spending time looking back at the manual or asking for help slows down the sales process and it is frustrating for everyone involved. These are always concerns during an adoption or transitional period. Rather than introducing the technology in increments, it is more efficient to go to market with a Clover POS solution that is already tailored to your needs. In other words, although these apps are readily available and can be added on over time, they can be streamlined with custom integrations. As Clover partners, Chetu ensures Clover POS software is integrated with financial, inventory management, staffing and all other needs from small businesses and that it works with all devices including tablets, phones, printers, and desktops. The usability features, mobile version and reporting and analytics feature solutions can be customized for optimal performance that small businesses are looking for. As demand increases for updated POS business owners will be looking for technology that fits their specific needs in a modern high-functionality.